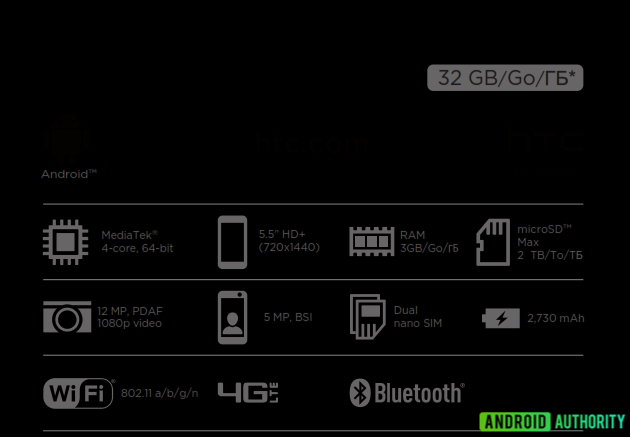 Home / HTC / NEWS / HTC Desire 12,a competitor for Redmi Y1? HTC Desire 12,a competitor for Redmi Y1? We are seeing that HTC is struggling to stand in market from past few years.The recent leaks claims that HTC may unveil a entry level phone soon,may be at MWC.According to new leak,they might launch a phone in Desire series, which is named as HTC Desire 12 and its key specifications were out by its retail box. While going through leaked features it will come with Mediatek quad core processor which is mated to 3 GB RAM and 32 GB storage.It will have 5.5 inch HD plus display panel with 18:9 aspect ratio.Desire 12 will be equipped with a 12 MP shooter as well as 5MP selfie sensor.The rear camera is capable to record videos in 1080p.Additionally,it will be fueled up with 2730 mah battery. From this I assumes that it will come with pre installed Android 8 Ore and also expect it may cost below 9k. Now I think that it may be competitor for Redmi Y1 while considering price of both.Because Redmi Y1 also a 5.5 HD display phone with a quad core processor and battery size is 3000 mah,but there is an advantage in 16 MP camera.